To access the area, speak to Princess Brionie in Castia Corridor. Cloudy Treasury is an event open to players from 00:00 to 24:00 (always). The level required to participate in this event is level 40. You have a total of 8 minutes to collect as many chests as you can out of 31 chests in this event. Once the 8 minutes have expired, you will receive a "You failed the Dungeon" message, regardless of whether you got all of the chests or not. When you enter, you will be in an area where the map (M) will be disabled and the mini-map shows your character's location over a "mystery map". You need to navigate the event area manually. As you move along, you will notice "Ancient Treasure" chests scattered about. These chests may contain useful bound items such as HP Elixirs and Pet Stamina Crystals (see the list of items below) or they may be cursed. If so, one of two things will happen. The "Ancient Miasma" insignia will appear next to your mini map and will inflict 10% of your HP in magical damage (MDMG) for 300 secs until you die. The other insignia, "Medusa's Curse", will kill you faster if your character has less than 500,000 HP. With bonuses such as damage reduction from souls or cards and high DEF & MDEF, it might be possible to endure the effects of the trapped chests for a few more seconds before dying, allowing you to collect more chests. This is the second insignia, that kills your character faster. In both cases, a dialogue box will appear saying "[your character] killed you." Note: By dying from the poisoned/trapped chests, the player kill counter for the Psycho, Maniac, Hitman and Butcher achievements will consider it as killing another player and will increase by one when the dialogue box saying you killed yourself pops up. By opening an Ancient Treasure chest, you can collect 1-3 items at random from the following list. Note: the following items will be "Bound", which means you can't sell or trade them with other players. SPOILER WARNING: By clicking on "Expand" in the table below, a player-made map of the area will be displayed. If you feel that using a map to learn about this area is a form of cheating or that it takes away from the challenge and the mystery of the game, do not click on "Expand". You have been warned. A player-made map of the Cloudy Treasury event. Click on the map thumbnail to the left to view a larger version. You can also left-click on this link and then right-click over the image and choose "Save image as..." to keep it on your computer. This map was updated on Dec 18, 2013. One non-existing portal location was eliminated from the previous version and the other locations were re-numbered accordingly. 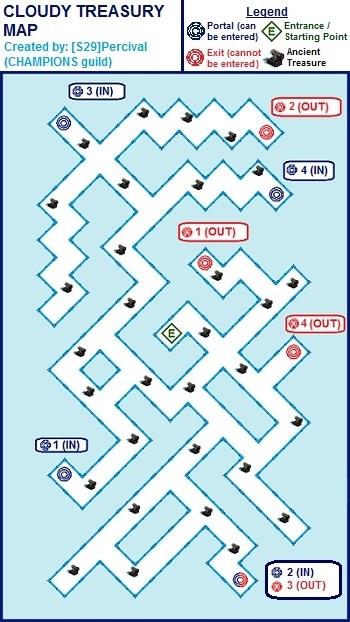 The blue portals on the map represent entry points that are visible as you navigate through the event in the game. The red ones don't actually appear as portals in the game, they represent exit points. The portal have been numbered to show where the entry and exit points are. Example: If you enter from "1-IN", you will exit at "1-OUT" and so on. All "IN" (blue) portals on the map can be entered more than once. The portals don't disappear after you use them. Shinakay's Cloudy Treasury Guide (US IGG Forums) : there are additional details and pictures and an alternative version of the map.